Hoping to get a little clarification on the X590 port documentation. Back in December I used an X590 data sheet with a creation date of 7/30/18 to create a comparison matrix. Based on the first image I said it had (1) 40G port and (2) 100G ports. My boss questioned me on that because he looked at the datasheet currently available on the Extreme website and saw the second image below. I believe we both first read that as (this QSFP+ port could only be used for stacking). As I was processing that and trying to figure out how I made such a mistake I thought about the X465 datasheet I was looking at yesterday. That datasheet contains the words "dedicated stacking ports" which clearly means those ports can only be used for stacking. 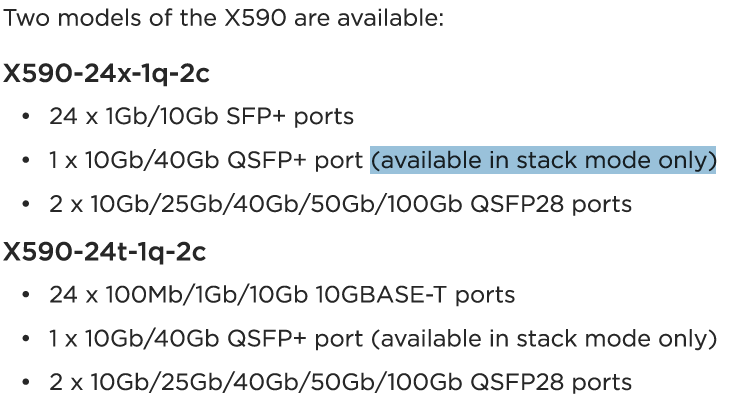 So what does "available in stack mode only" mean? X590 can use 2x 100 Gig ports as uplinks at most. But if you stack (with those 100 Gig ports), to have any uplink a 40 Gig port becomes operational. Take a look at the table on page 3 of the data sheet, under 'Ports' row there is 'Selectable QSFP Port Configurations'. Reading page 3 again did help clarify things.